One of the most exciting advances in orthodontic technology is the development of the Invisalign system. Instead of bothering with clunky, uncomfortable metal braces, Invisalign patients wear a series of clear plastic trays (similar to a mouthguard) to shift teeth into the proper alignment and position. San Francisco cosmetic dentist Samir Ayoub is pleased to offer treatment of crooked, crowded or widely spaced teeth with Invisalign. Read on as he outlines some of the most appealing benefits of Invisalign treatment. For most patients, the transparency of Invisalign aligners is the number one benefit of treatment. Unlike traditional braces that have metal brackets and wires, Invisalign aligners are clear and virtually unnoticeable. The transparency makes Invisalign a great option if you are a working teen or adult and want to avoid calling attention to your teeth straightening treatment. 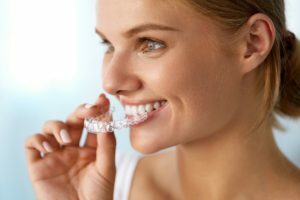 Another fantastic benefit of the Invisalign system is that the aligners are made from a soft plastic material and customized to fit the unique contours of your teeth and mouth. A big problem with traditional braces is that the metal brackets and wires can scratch or irritate the gums and insides of the cheeks. The comfort of Invisalign aligners is a tremendous advantage. Invisalign aligners are easy to remove and put back into the mouth as needed. They should be removed for eating and drinking anything other than water, as well as for brushing and flossing. Being able to remove the aligners to eat and drink prevents any restrictions on diet, as you can enjoy all the sticky, crunchy or chewy foods you like without worrying about the foods getting stuck in your braces. Traditional braces require regular follow-up visits for tightening and adjustment. This means you have to spent quite a lot of time in the dentist’s or orthodontist’s chair. In comparison, Invisalign is much more convenient. Although Dr. Ayoub will check in periodically with you to chart your progress, the time commitment is significantly less than it is with traditional braces. If you are interested in straightening your teeth with Invisalign, Dr. Ayoub invites you to schedule an informational consultation. Please contact our San Francisco office today to book your visit.